but wait..what's that...Whoa! Whoa! Whoa! ! Look at the name of the act. Is this the way for Congress to wrest back control from the Clowns in Gowns and their "interpretations" of the Constitution? Or am I making more out of it than I should? Doubt it goes anywhere, and more than likely trump will veto it is congress passes it. War; everything in the world wrong, evil and immoral combined into one and multiplied by millions. Pretty sure there's some congressional bylaw that requires acronyms to be the OPPOSITE of an act's intent. Maybe brilliant timing! I don't have enough info to judge, and Rand does, he's there with these jokers all the time. I could see it getting some good traction! Good job, Rand. What a beacon of hope. The article says he floated this back in '14 but there wasn't as much interest in reform then as there is now. Hopefully this gets passed and President Donald signs it into law instead of ruining Rand's career. Trump? More like John McCain. Care to post all the anti police state comments Trump has made? Wasn't it trump that said he would help destroy a congressmen that was trying to stop civil forfeiture. McCain's position is this is obviously a Russian plot. Rand is just being a tool for Putin who is trying to impose actual freedom on American citizens. LOL! Exactly. Even though McCain takes his marching orders from China. Not a bad start, nicely bipartisan. Would this effect local and state government as well or only federal? If so isn't this federal over reach? This will be an interesting bill to follow since if it passes it will have much wider implications than just asset forfeitures. The current system is based on the principle that all assets are owned by the bankers as collateral against all debt issued through their private monetary system. That is why they can legally take anything they want. They "own" it. The people are only allowed to "use" it. DEA agents at the Cincinnati/Northern Kentucky International Airport stole $11,000 in cash from college student Charles Clarke—his entire life savings, in fact—simply because they claimed his checked suitcase smelled like marijuana. Apart from the sniff test, no drugs or evidence of criminal activity were found. It should be impounded and destroyed as contraband. 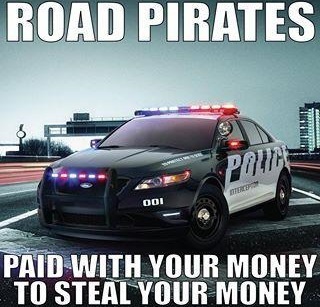 And once forfeited, local law enforcement in many places can use this money for almost anything it wants. This is how civil forfeiture has earned the nickname “policing for profit.” And this is why the Trump administration thinks forfeiture funds are on the table for a border wall. Building a wall with federal forfeiture funds is no slam dunk. Federal law limits the use of such funds to certain law enforcement purposes. “Border wall” is not one of them. And it doesn’t look like Congress would take action to change the law so that “border wall” is a permissible expense. Even though we’ve heard a member of Congress suggest that a wall should be built with forfeiture funds, most federal officials are strongly opposed to civil forfeiture. On Tuesday, Sen. Mike Lee (R-Utah), a civil forfeiture reformer, questioned Attorney General nominee William Barr on the practice. Lee got Barr to concede that you “have to strike the right balance” on civil forfeiture. In 1991, Barr said that civil asset forfeiture could give law enforcement a “speed-trap mentality” where agencies pursue forfeitures to line their own coffers. And last week, Reps. Tim Walberg (R-Mich.) and Jamie Raskin (D-Md.) kicked off the 116th Congress by participating in a briefing on civil asset forfeiture reform, with Walberg sharing his plan to again reintroduce the FAIR Act, a comprehensive reform bill on the subject. 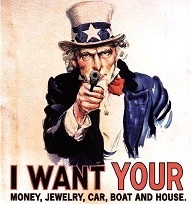 Last Congress, the U.S. House adopted bipartisan amendments to a spending bill that would have prohibited the Justice Department from using federal dollars to increase forfeiture practices, but those amendments were not included in the final package.